Keep in mind, we do not store lead information—instead, we send opt-in data to your connected services. While there are ways to access your leads directly from Leadpages, we recommend integrating with a third-party service in most cases. In most cases, we recommend integrating your forms (in pop-ups or pages) with an email service provider, CRM, and/or a webinar service. 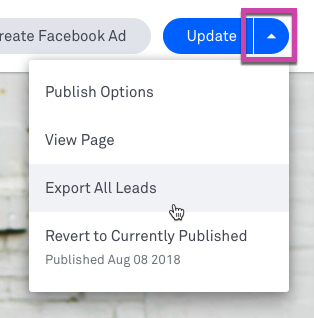 That way, you can access and act on your leads once they opt in through Leadpages. Most services we integrate with store leads in a database (like a subscriber list). Check with the services you use to learn how you can access your opt-ins—many will even allow you to export your lead data. To check where leads are sent to, open the integration settings for your form. You can find step-by-step instructions for accessing integration settings here: Choose a Destination for your Leads. NOTE: Our CSV download feature is only available with sites, pages, and pop-ups. We do not store lead data for opt-in texts, or trigger links. Open the page whose leads you’d like to export in the builder. Click the drop-down menu next to the Update button in the top-right corner of the page. Then, select Export All Leads. Leadpages will export your opt-in data to a CSV file that you can use in your favorite spreadsheet app (ex. Google Sheets). NOTE: Submissions after May 11th, 2018 are included in the CSV download in the Standard Builder. Open the Standard page whose leads you’d like to export in the builder. You can also gather lead data via Lead Notifications—the default integration for our Standard and Drag & Drop builders. When Lead Notifications are enabled for your form, our system will send opt-in data to your email every time someone submits their information. Each email will contain opt-in data such as leads’ email address, names, postal code, etc. depending on what information your form is setup to collect. NOTE: Any custom fields set up in your email service provider will not appear in the Lead Notifications email. That said, we do recommend integrating with a third-party service for more robust lead storage. What happens to my leads if my integration experiences a service disruption or goes down? Although it’s rare, sometimes third-party services we integrate with will experience downtime or other issues. In such cases, our system will store a backlog of any opt-in data that’s collected during the outage. When the service you use is operating normally again, we’ll send the lead data to them. Sometimes, services limit how much data can be sent at once—so it can take a bit longer than normal for your leads to end up in their system. We always send over lead data at the highest rate possible.